1 what the friends are going to do. 2. whether they will be able to do it. 3. why / why not they will be able to do it. 4. what the place is famous for. the tickets are sold out to star What's on? Theater. You told us that it's famous for its premieres. and handprints of the celebrities who have visited it. the movie. The cast is all of the actors who took part in the movie. 3 Read the English words for describing films and match them gj драма with the Russian translations. Blockbuster— this term was first used during World War II, and was a name for a very large bomb. It was formed from the words for a city block and bust, a verb meaning "to break". A blockbuster was a bomb large enough to destroy a city block. After the war this term started to be used to describe an important, popular and successful film or book. Western — a typical American film genre. The setting is usually on the American frontier during the second half of the 19th century (1865-1900). The characters in these films are usually cowboys and Indians. 5 a) Match the words used to describe films with the definitions. b) Use them to say what kind of films you like / dislike and why. b) what genre each film belongs to. c) who stars in each film. a) If yes, write down what the movies are about. Write 5-7 sentences. b) If not, which of them would you like to see? Why? 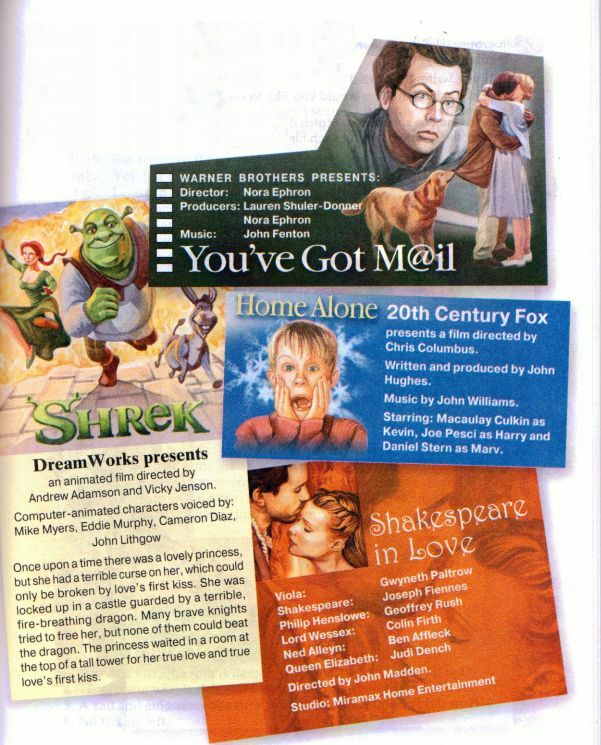 8 Listen to the film summaries. Match the titles with the summaries. Answer the questions about each film. 10 Let's play and talk. Work in pairs. Use the information below for your own conversations. A: You are a customer in a video shop. Your information is on this page. B: You are a shop assistant. Some extra information for you is on page 161. A Ask the shop assistant to recommend a film for you to watch. Answer his / her questions about your tastes. Listen to his / her advice. Ask him / her what the film is about, who the film director is and who starred in it. Make up your mind and choose a film. В Offer to help the customer. Ask him / her what kind of films he / she likes. Advise him / her to buy one of the four films that you have on special offer at the moment (use the information below to help you). You could also advise the customer to buy another film (not the films on his / her list). Answer his / her questions about the film. А Match the definitions with the words with expressions, you've learned in this unit. 1. The person who makes a film. 2. All the actors in the film. 3. The first time the film is demonstrated. 4. The person who is rich and famous. 5. A sad and emotional film. 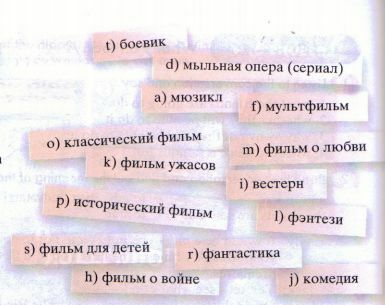 В Complete the sentences with the suitable words and expressions. 1. The scene is... in the 1960s in New York. 2. The film is... a little boy who leaves his home to find his father. 5. It's a brilliant romance. Greta Garbo... in it. 6. I'd like to know what's... today? 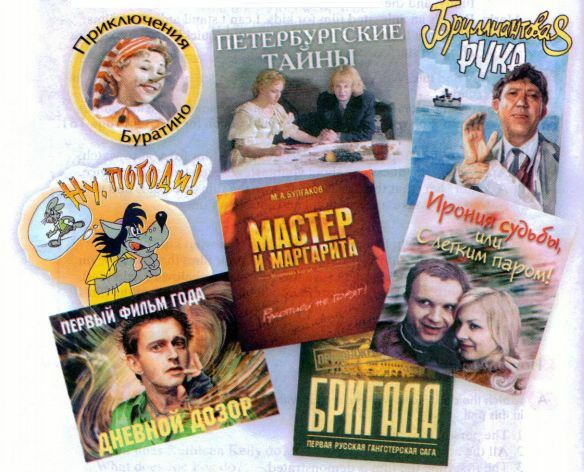 С a) What kind of films are these Russian films? Who stars in them? Which of them could be called a blockbuster or a cult film? D Write a short review of any Russian film that you like. 1. Shrek is a green ogre (a kind of monster) who hates everyone and just wants everybody to leave him alone. His peaceful life changes when evil Lord Farquad (Lithgow) sends all the fairy folk to live near Shrek's home. The evil lord has an ambition to become a king, and to do that he needs a real princess. He chooses Princess Fiona, but she is guarded by a dragon. So Lord Farquad needs somebody to save the princess for him. When Shrek turns up in Farquard's castle and asks the lord for some peace and quiet, they make an agreement. Lord Farquad will do what Shrek wants, if Shrek brings him the princess. Shrek saves Princess Fiona from the dragon, but his adventures are only beginning. 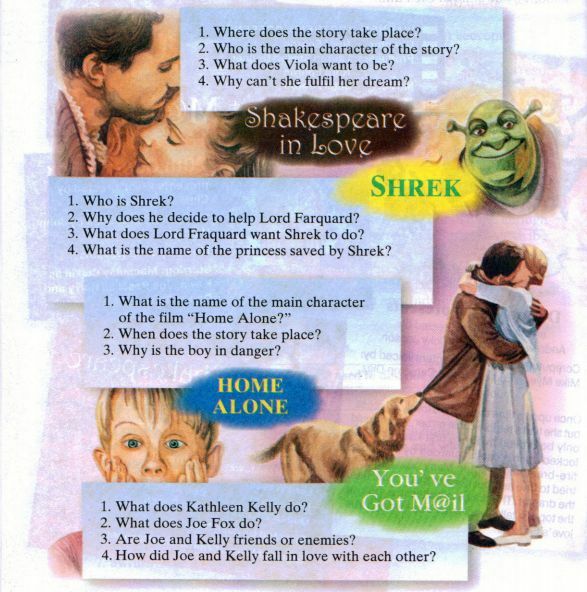 Shrek, Princess Fiona and their friend, a talking donkey, are going to learn a lot about friendship, life and love. 2. The owner of a large bookstore chain, Joe Fox (Tom Hanks), wants to buy a small local bookstore and close it, but the owner of the bookstore Kathleen Kelly (Meg Ryan) wants to keep her store. At the same time they are writing each other letters over the Internet without knowing who either of them is. In real life they can't stand each other, but over the Internet they fall in love. He finds out who she is, but she doesn't know this. Will Kathleen be able to see that the man who has ruined her business is really the love of her life? Will he understand that there are more important things in life than money and success? 3. Eight-year-old Kevin McAllister (Macaulay Culkin) is left at home by his family when they go on a Christmas holiday to Paris. At first the boy seems to enjoy the situation, but then he finds out that he is in danger. Two robbers, Harry and Marv, decide to break into the house. Will Kevin be able to defend his home? 4. The scene is set in London in the late 16th century. Young playwright William Shakespeare is writing a new play, called "Romeo and Ethel, the Pirate's Daughter". Beautiful Viola, who comes from a rich family, is a great fan of Shakespeare's plays. Viola's father is going to marry his daughter to cold-hearted Lord Wessex, but she dreams of being an actress. Women can't go on the stage, and all female roles are played by men. Viola dresses up as a boy and goes to the theatre. She gets a role in the new play, and soon she and William fall in love.